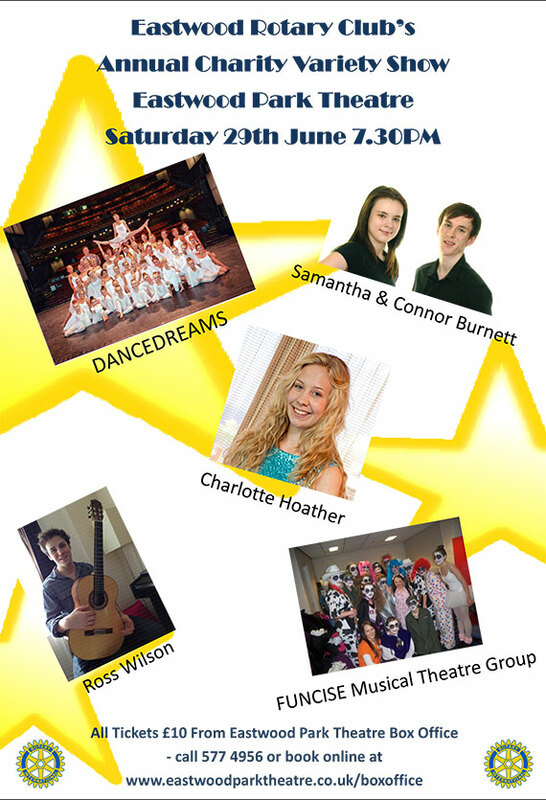 I have been asked to perform in the Eastwood Rotary Club Charity Variety Show, which is to be held at the Eastwood Park Theatre on Saturday 29th June at 7:30pm. The Eastwood Rotary Club’s annual charity concert is a popular event which entertains while raising funds for the club to continue supporting local charities. I will be one of a number of acts which this year include solo singers, instrumentalists, dancers plus an excellent musical theatre group. The show intends to cater for all ages so you can be sure of an excellent night of family entertainment… and you’ll be helping raise funds to assist the neediest in our community. Eastwood Park Theatre, Rouken Glen Road, Giffnock, East Renfrewshire, G46 6UG. You will be in my prayers, Charlotte, as you prepare for your performance. I know you will do an amazing job, and everyone will be blessed by your performance. May God bless you on every level! You would have been most welcome had you been close enough to make it, but the sentiment of your lovely comment is really appreciated. I love Rotary Club and I pray you all do well and get oodles of money. Be blessed! Thanks for your support I love to help when I can as the work that they do is fantastic for their local communities. You will be most welcome whenever you get the chance to drop by. Might be not quite possible: I live in PA. Thanks Joanne, I will pass on your good wishes to everyone who is performing on the night. I hope that you get chance to come back again soon. All the way from Texas, let me thank you, Charlotte, for supporting Rotary Club. I am a member of our local Rotary here, and our group does just fantastic work, supporting students, higher education, literacy, and much more. It’s a wonderful community service organization, and I’m so glad they’ll have your terrific voice to help them raise money. Well done. It is great when you are able to help out whilst doing something that you love. It’s always a treat to listen to your singing Charlotte, I’m sure the show will be a success and i’m sorry I’m so far away. What songs are you singing? Such exquisite feeling you have imbued into such a well loved song. I so enjoy your music. Thank you so much Lesley, I am glad that you enjoyed my performances of these songs. Simply congratulations for your voice and for the talent to create moments of art by your music. All the best. Angelo. Thanks Angelo they are very kind words I hope that you get the chance to visit with me again here soon. Im simply honest, Charlotte. Thank you very much and go on with your music. IT’S TOO FAR FOR MY COMMUTE, BUT SOMEBODY MIGHT WANT TO BE ENTRANCED FO A GOOD CAUSE!!!!!!!! Best wishes to you, Charlotte, as you pursue your dream. Thanks for also following my blog. Thanks Carolyn for your encouragement. I hope that you can come back and visit with me again soon. Love’s philosophy is a song by Jamiroquai. We also have an Eastwood near us in Nottinghamshire.